It is the vine-draped Africa of Tarzan, diametrically different from the glowing plains and low hills of Kenya and Tanzania. It is a world of deep shadow, dripping branches and a leafy carpet that explodes with insects at each swishing movement of the shoe. And here, in a finite range south of the Congo River, lies the home of homo sapiens’ nearest genetic relative, the bonobo. Judging exclusively by appearance, the bonobo appears at first blush to be a slightly scaled down version of the chimpanzee. But the differences are significant. The bonobo is indeed smaller than the chimp and its facial features, although structurally similar, tend to be much darker. Unlike the chimp, its lips are a bright pink. Behaviorally, the bonobos bear even less similarity to the chimpanzee. They are demonstrably more peaceful, cooperative and much less aggressive. 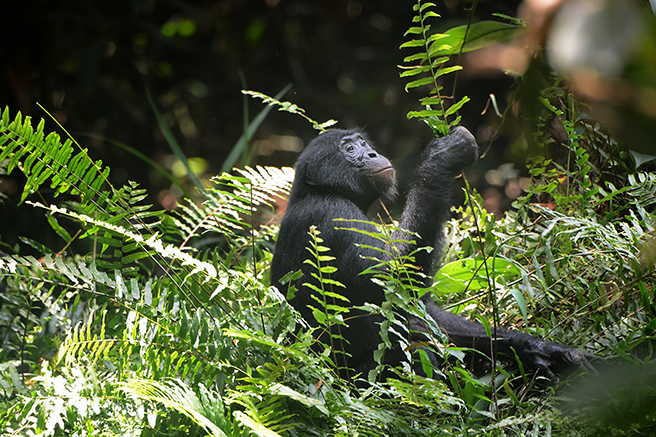 The sum total of the world’s bonobo population is not known with clarity, but it is certain that they are found only in the DRC, their range is restricted and shrinking, and they are among the world’s most critically endangered species. And I can confirm now from personal experience that bonobos are not easy to locate in the wild. Just reaching them can be an arduous physical challenge. In order to get to the Iyondji bonobos, one must first endure four hours on the back of a dirt bike from the remote village of Djolu. Then there’s about a two-hour trek to a lovely river, the last half of which is through a treacherous swamp that can (and in my case, did) swallow a person past the waist. This is followed by an hour-long pirogue ride to another trailhead through a stunning canopy of trees. 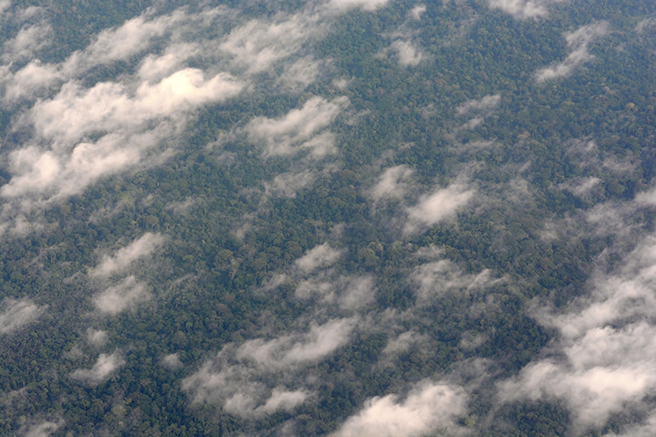 The next leg is about an hour and a half up a gentle slope through heavy forest to an isolated tracker’s camp, about a two acre clearing adjacent to a pristine stream in a stretch of heavy jungle. The camp is clean and well maintained, but its most prominent feature is its insect life, specifically thousands of bees. They are not large (about the size of an American honey bee), nor are they particularly aggressive, but they are omnipresent during daylight hours and entirely inescapable. And they do sting. Along with my friend Nakedi Maputla, I joined AWF’s trackers at this camp early on a March evening with the hope of locating and photographing bonobos in the wild. 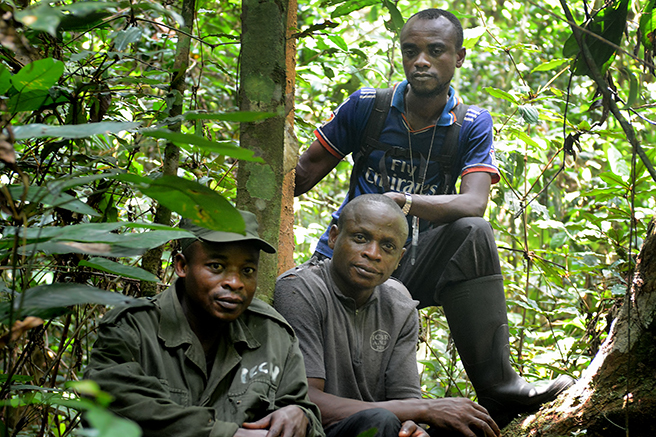 About an hour after dark a team arrived from the forest with the good news that the bonobo troop under observation had nested for the night less than two hours from us. An early start the following morning would allow us to reach them by sunrise. On schedule, at 3:30 am the lead tracker appeared at my tent fly and said ‘Mr. Billy … it is okay to wake up now.” By 4 am we were off, winding through dense forest after a heavy rain, and by 5:45 we were with the bonobos. The entire troop was up and in motion by 6 a.m. but it was impossible to capture any images because the early morning light, particularly under overcast skies in deep cover, was entirely inadequate for photography. The troop began to “march” through the treetops at about 6:15 and that’s when the real fun began. 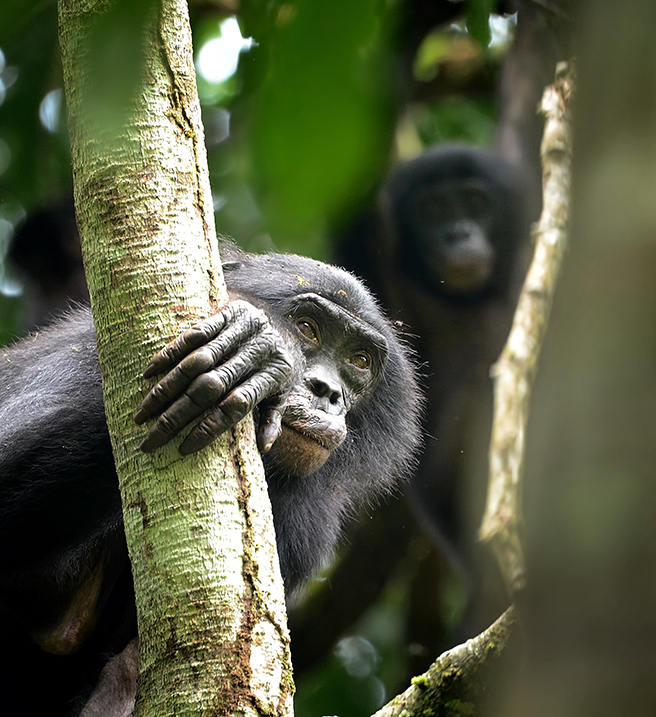 The bonobos sped freely through the canopy as if they were on a mission. On the ground, the going was much more difficult. The trackers hacked through tough undergrowth for several hours in pursuit and many times it appeared the troop would elude us. But they usually managed to give away their location with a series of shrieks and we were off again in pursuit. At around 11 a. m. the animals took a short breather, resting in the branches a short distance away. This troop was not habituated to human presence. At best, they were mildly and occasionally tolerant … but for the first and only time on that day they were “photographable.” With the aid of Nakedi and his persistent team of trackers, I was able to capture a few images. The bonobos began to march again shortly thereafter and they remained well out of photo range for the balance of the afternoon. Day two was launched with unjustified optimism. The primary tracking team departed camp at the usual time, but we, with the mother of all bad calls, left two hours later at 6 a. m., having learned that photos were impossible before 8 o’clock anyway. The advance party located the bonobos before sunrise, but it took our photo team six full hours to catch up with them and the bonobos. The troop began to march just as we caught up with them and we were led on another grueling hike through heavy undergrowth and across wide streams. Finally, in the middle of an oppressively warm and humid afternoon, the troop halted near a river and a lone bonobo eased into view, just within photo range. My assistant slapped on my 80-400mm lens and I started clicking. After about a dozen or so shots the humidity overwhelmed my equipment… but by then the bonobos were on the march anyway. This time they outpaced us and we were finished for the day. Two days of bonobo trekking left me with some very powerful impressions. The most immediate was the knowledge that this was far and away the most labor-intensive photography I’ve ever attempted. Nakedi and I estimated that we’d hiked about 35 kilometers during those two disproportionately warm days and come back with less than twenty usable photographs. That seems a small return on physical investment, but I wouldn’t trade those few images for a thousand good elephant photographs from Amboseli… that’s because I can ride in a land rover in Kenya, sit still while the elephants brush past me within arm’s length and relax and have a sip of water whenever I damn well feel like it. I was also amazed by the stamina of our trackers. Granted, they are all decades younger than me, fully acclimated and none of them have an ounce of fat. 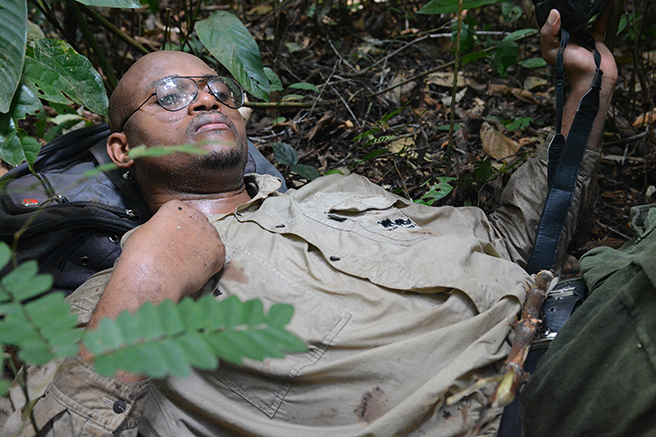 But to be able to go all day in tropical heat without taking a drink, to navigate barefoot across a forest floor that continuously tripped me up, and to locate bonobos in a jungle the size of Texas… it all seemed superhuman. They have my utmost admiration and respect. But the most compelling aspect of this experience for me was simply the opportunity to stand in company with some of nature’s rarest animals… and to appreciate the extraordinary opportunity to experience the rain forest in a way that most people never will. I can’t wait to go back. Billy Dodson first became interested in photography while on a mountain climbing trip to Tanzania in 2001. He visited East Africa for the first time as a photographer in 2005, and has since returned to Kenya and Tanzania several times for the purpose of photographing African landscapes and wildlife. Billy generously donates his photographs to African Wildlife Foundation to advance wildlife conservation—a cause he is extremely passionate about. For more information, visit Billy at http://www.savannaimages.com.